My name is Chelsea, and I have a Mexican food addiction. Now that that's out of the way, I can share the latest dish that has graced our dinner table. Seriously though, all I want to make lately is Mexican food. I'm going to go with it's because Mexican food equals a perfectly good excuse to serve chips and guacamole, and Parker and I eat that stuff up like it's our last meal. 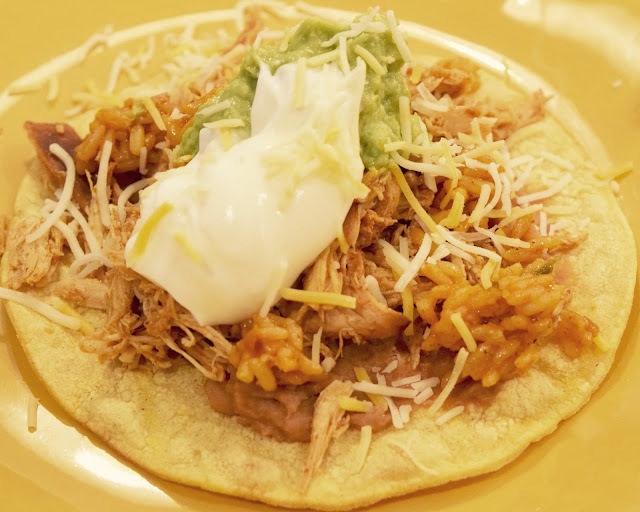 These crockpot chicken tacos could not have been easier, and they were a nice twist on the typical taco night. 1. Place chicken breasts, taco seasoning, and salsa in a crockpot and cook on low for 6-8 hours. 30 minutes before eating, shred chicken with a fork and stir together with salsa/taco seasoning mixture. 2. Load up a tortilla with your chicken and favorite garnishes and eat! So so simple! The chicken had a great flavor, and it tastes like you are putting much more effort in than you really are! Tacos are a favorite in this house, I will definitely be making these! I might actually have to try this! I'm not usually a salsa fan, but I love Mexican food + anything in a Crockpot. Mmmmm... so yummy! Love using my crockpot no matter how hot it gets outside!